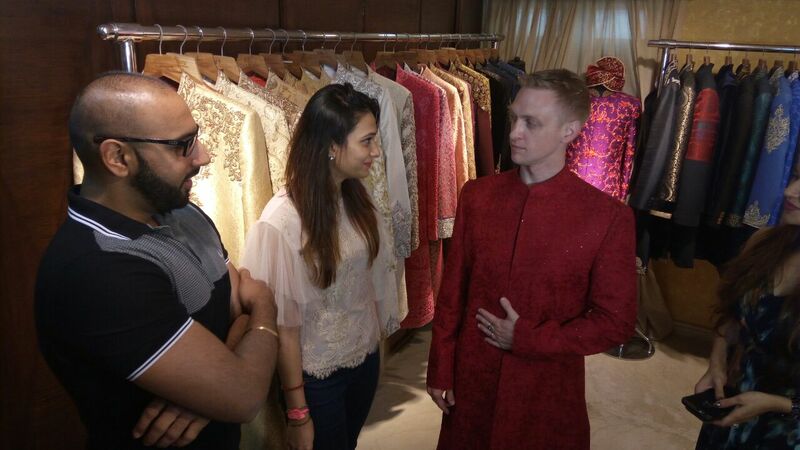 Ace designer duo Pawan & Pranav have designed the wedding costume for Brent Goble for his wedding with much renowned telly actress Aashka Goradia. "Brent wanted something extremely traditional for his wedding, so we decided to go with a classic gold sherwani for him, maintaining the Indian tradition but still giving it a modern touch" said Pawan & Pravan. Traditional glamour meets sophistication & contemporary sensibilities in Pawan & Pranav's breath taking sherwani for Brent Goble's wedding.Adorned with richness, sophistication and sartorial splendor, Pawan & Pranav's wedding sherwani for Brent Goble's in rich gold is class apart.Pawan & Pranav have consciously combined both prime factors in Brent's outfit, Indian traditions and western sensibilities. Instead of being garishly covered with embellishments, Pawan & Pranav's design is subtle, unique and creatively adorned with lavish yet refined craftworks. Brent Goble's wedding outfit can be aptly defined as a royal marriage of traditional ethnic charm & new age modernity combined to create a timeless sensation.